Sugar Skulls and Party Info! Dia de los Muertos is the day we honor our loved ones that have passed and whose spirits still live on in our hearts. As we prepare our ofrenda, our alter, we wanted to leave something sweet for them. Kami, from the Tinkering School, came over and brought sugar skulls and icing for us to decorate. It was so great to see all the beautiful bright colors on the white sugar. They all came out spectacular! Thanks Kami! We had a great time. 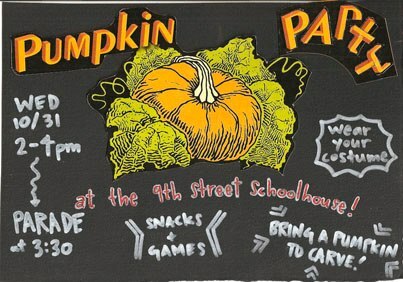 Join us for our Halloween Party and Parade this Wednesday, the 31st!